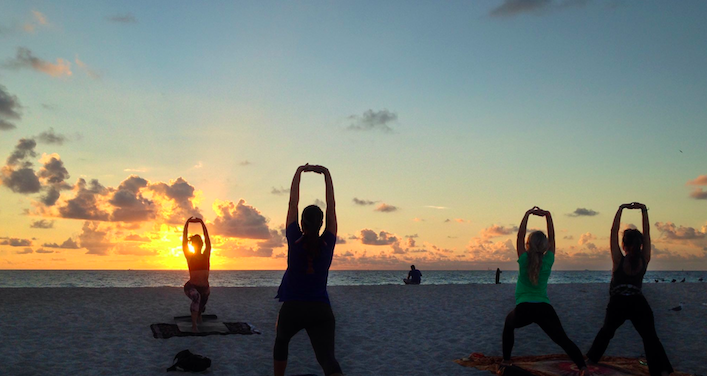 I am teaching a sunrise yoga class, on the sand, by the yellow and orange wooden lifeguard tower at Third Street Beach. The sky beyond is exploding in golden pinks as the sun is just appearing at the ocean’s horizon — yes, this could, and should, be an amazing moment. But it’s not, because none of the students in front of me are paying attention; instead, they’re yabbering to each other or helplessly absorbed into their phones. My attempts to gather and center the group have all failed. A total yoga teacher nightmare. I walk over to the stereo to fiddle with the music and buy some time. How in the world am I going to teach this class, I’m thinking. Then, suddenly, the stereo starts playing Abba’s “Dancing Queen” really, really loud. That’s not exactly a proper meditation beat. But, more importantly, it’s not in any of my playlists. And come to think of it, we don’t even have a stereo at the beach classes! This is when I realize I’m dreaming. It’s like a push — moving through the illusion and taking control since, clearly, my subconscious is well-immersed in its own directorial shenanigans. In dream lingo, I become lucid. In that very same moment, I do what I always plan on doing, what I prepare for and practice doing in waking life. So I lift off the sand like a bird and start circling over the group of people effortlessly, enjoying the wind brushing against my skin as I’m flying, and guess what — I have their full attention now. I hear myself cry out, This is what meditation can do for you! And I’m starting to feel much better about myself. You could say that my ego is getting a little inflated. And just as I catch myself feeling superior because I can fly, I lose control and crash into the ocean. Waking up, I think, This is what instant karma feels like. Is there a connection between my practice of lucid dreaming, and my path as a yogi, you may wonder? Yes, indeed, there is a Tibetan style of dream and sleep yoga in which your waking life is just a preparation to fall asleep and practice yoga in your dreams. In your dreams, anything is possible: from flying to breathing under water, walking through walls, making large objects small, scary things friendly, and all that good stuff. But there’s also the possibility of changing the past, receiving teachings and removing karmic traces in order to eventually transcend emotion and dream pure, white light. I’m nowhere near enlightenment, but I’m making progress. When I wake up in the morning, I scribble down anything I remember in my dream notebook. I once got great advice, which was to not judge some dreams as more important than others and just write them all down. To not analyze the dreams, but to note what emotions I go through while dreaming. For example, I have a recurring nightmare that I’m back in high school in Sweden, where I grew up, and failing advanced physics because it has nothing to do with space and time, which I’m interested in, and everything to do with math and mechanics, which I don’t care for (true story). So many times, this seemingly silly dream has haunted me, making me feel guilt and shame for my failure, until a little while ago, when I finally stood up for myself in that dream and said, I’m just gonna study something I’m interested in instead. What a relief. Resolving dream problems can resolve real-life problems. I felt empowered about my life choices afterwards. If, after reading this, you might find yourself wanting to start a lucid dreaming practice, good for you because that urge in itself is already the first step: wanting to dream, and wanting to remember your dreams before you go to sleep is essential. Then write down or record everything you remember first thing in the morning, cultivating a feeling that the dreams are important. Next step is to look at your hands, all the time, and ask yourself: is this a dream, right now, am I dreaming? The idea is to eventually do this inside a dream. The answer will then be yes, and... bam! You’ve pushed through the illusion — you’re lucid. Following two years of looking at my hands in waking life, I got the chance to do so in a dream. There I was, inside the dream, looking at my hands, and yes! I remembered. But wait, I thought, where are my hands?! My hands are invisible, starting from the elbows and all the way to the fingertips, they are completely transparent, so I blink and blink and try to stare my way through the illusion, but nope, I can see no hands. Completely contrary to what I’ve learned about your hands always being with you in a dream. Not always! I can almost hear my subconscious laughing at me. After a while of blinking and staring, I smile back at my subconscious prankster-self. Now I understand why the ancient yogis say that one has to have a sense of humor in order to progress on this path. Ewa Josefsson pens the “Goodness” column for SG. She writes from the intersection of ancient wisdom and modern ignorance.